This report is written for anyone with an interest in philanthropy and how to make it more effective with higher impact in the future. We hope it will be useful to individuals, charities and other NGO's, businesses and governments as well as advisors to each of these audiences. Taking the long view has never been easy. However, as change accelerates in an increasingly connected world, more organisations are looking further ahead to better understand emerging opportunities and threats. We believe that sharing knowledge across disciplines and across continents can add real value to the process, particularly as often innovation occurs at the intersection of different industries disciplines and challenges. There are a host of changes that we need to think about when considering the next ten years. Some are incremental evolutions, and some are radical revolutions. The big challenge in any foresight programme is in differentiating these and gaining a clear understanding of which changes are most likely. 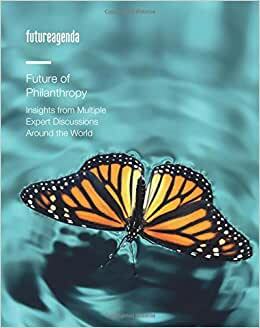 The intention of this report is to consolidate expert views from nine workshops in seven countries around the future of philanthropy and how it will develop. This understanding will make it easier to shape a strategy that will address upcoming challenges and opportunities. We offer a summary of the key trends and drivers that will be influential and identify areas of potential change. As such the report provides insight about the leading edge of philanthropy today as well as where it might go in the future. Our hope is that this will enable you to make a bigger difference for society in the years to come. This decade sees philanthropy at a pivotal point. The evolving geopolitical landscape, the rapid creation of new wealth and a greater awareness of how philanthropy can create social change have already led to exciting innovation and new thinking. This is influencing approaches to giving and social responsibility across the world. During our conversations three interconnected drivers of change were identified. They are Power, Knowledge and, inherent to both of these, Trust. They will shape the evolution of philanthropy over the next decade. Start reading Future of Philanthropy on your Kindle in under a minute.